Once upon a time, a Buddhist monk called Genpin lived in Miwa Village in Yamato Province (near present day Sakurai City in Nara Prefecture). A woman visits him every day at his small house. She brings with her branches of Japanese star anise and water for the offering to Buddha. On a lonely autumn day, as Genpin decides to ask the mysterious woman’s name, the woman comes again. She asks Genpin if he can lend her a piece of kimono since it gets cold at night. He willingly accepts her request and gives her a kimono. When the delighted woman is just about to leave, Genpin asks her where she lives. She replies that she lives at the foot of Mount Miwa and advises him to find a gate with Japanese cedars when he visits her. She then disappears. 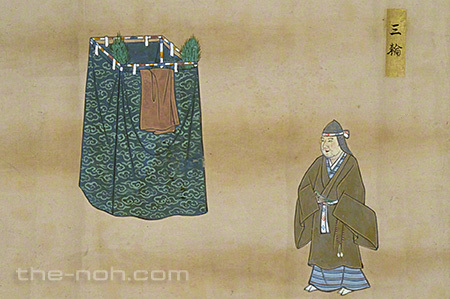 A villager who has just visited the shrine of Miwa Myōjin (Deity of Miwa) notifies Genpin that he found Genpin’s kimono hanging on a branch of the sacred Japanese cedar tree on the shrine grounds. 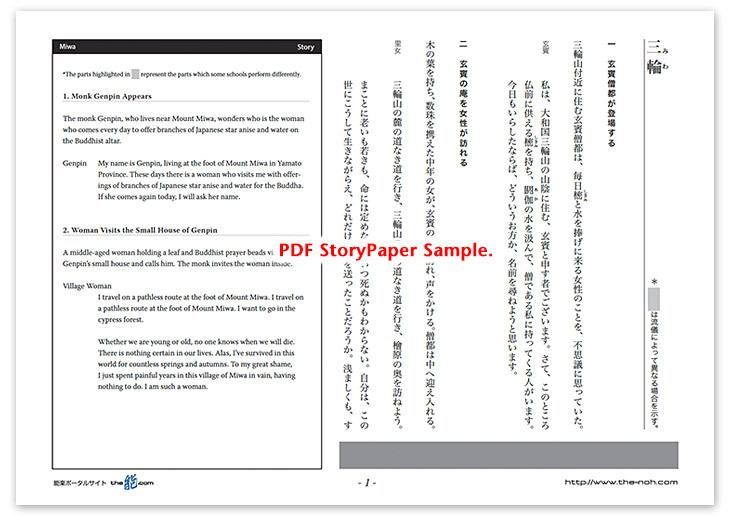 Hearing the news, Genpin comes to the cedar tree and finds that a Japanese poem is stitched on his kimono. At that moment, he hears a beautiful voice from behind the cedar tree, and the Deity of Miwa, who has transformed into a female, appears. The deity tells Genpin that deities debate how they can save all suffering beings on earth and therefore they too suffer as humans do. She requests him to save her sinful self. She then narrates the story of a god-and-human couple who once lived in the village of Miwa and while telling the mythological story of Ama-no-Iwato, she dances. When Monk Genpin wakes up from his dream at dawn, the deity vanishes. This piece describes a story in the village of Miwa in Nara Prefecture, the home of Japanese mythology. Various troupes of Yamato Sarugaku (Yamato-style humorous mime), which later developed into the current Noh schools, originated from the area near this village. The village of Miwa, whose villagers worship the whole Mount Miwa as its deity, is quite an attractive place giving off a special mystique. Suitable to the story of Miwa village, this Noh piece is filled with mysterious and poetic atmosphere, which might bring you the feeling of comfort, nostalgia, and fantasy. With Monk Genpin, the audience is gradually enchanted, slowly leave their world, and enter the mysterious world of deities in the woods of Japanese cedars at the foot of Mount Miwa. They will eventually find themselves meeting with the Deity of Miwa, who transformed herself into a noble and elegant female, listening to the ancient myth of the deity, and indulging in the dreamy music that the deity performs. Furthermore, they are introduced to the myth of Ama-no-Iwato. To conclude this Noh drama, group reciters chant “I will miss it. I don’t want to wake up from this dream.” It is truly a piece which makes you feel that you do not want to wake up from this dream.